Help the moonbears towards the road of freedom! 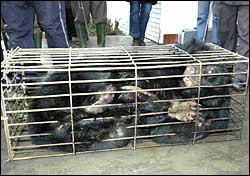 No words can express the horror, pain and abuse these magnificient creatures are currently going through for the highly sought after bear's bile used in chinese medicine. One cannot help but weep for these endangered beautiful bears, many of whom are missing limbs from being caught with traps in the wild. 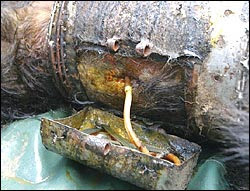 Incarcarated, undernourished and suffering from trauma in coffin cages for as long as 20 years, they have a huge piece of metal tube pierced through their abdomens without anaesthetic nor sanitation and not being allowed to move, to draw liquid bile from the gall bladders 24 hours a day. It is just horrendous. Are human beings only capable of destruction and exploitation? Are we made of stone? It is not as if there are no herbal alternatives to bear bile. I am just plain disgusted! Currently there are more than 7,000 bears imprisoned in these torture farms, and China Bear Rescue (according to the website) has led 219 bears to freedom, their main objective to shut down bear farms in china forever. It is amazing that these sunbears are able to forgive decades of severe abuse by humans as shown by their recovery and playful nature in the rehabilitation centre, making the success story even more poignant. OH my GOD!!! This is so awful! Those poor bears! Do you know if this still goes on or has something been done to stop it? I will visit ChinaBearRescue's site and show support. Thank you for sharing this, its so very sad. Sadly it is still going on but I believe there's certain awareness as compared to the past from bear bile imports and from the media. Another location the welfare is looking into is Vietnam (I think), they have a couple of thousand bears suffering there too! This is so sad! I wish these practices stop soon!